In 1900, the Vermont Woman's Suffrage Association petitioned the Senate to pass a law releasing women "from all taxation...until representation was granted them." How did the all male Senate respond? a. Sent it to the Committee on the Insane. As part of the November 2008's League Of Local Historical Societies and VT Museum and Gallery Alliance Annual Meeting, we were treated to a wonderful one act, two actor play, "Mildred Taken Crazy" . It chronicled the life of Mildred Brewster who was found guilty of murder in a love triangle in 1897 Montpelier. Also found insane, she was eventually released and moved to Washington state where she owned a boarding house. It was written and performed by Denny Partridge and Steve Friedman who answered audience questions afterwards. The genesis of the play was an old newspaper framed on the wall of one of their friend's homes. The headline declared the verdict, but no one knew the story. Who were these people, what happened to Mildred, what did it say about that moment in time? Curiosity ate at them and after some detective work, and luck, they pieced together a fascinating story. As in art, so in life many of these journeys of discovery start with a curiosity to know more about others and ourselves whether it's murder or 3-ply packing cases. This is what the MHS is about as well, to find the grains of truth about our heritage and to preserve them for others to discover and enjoy. We have some major challenges ahead of us in this regard, including structural repairs to Pratt Hall and a new archival and exhibit facility. I'm grateful for all of your support, and hope you will be able to continue to help. The Board and I wish you all a happy and prosperous 2009. Happy New Year! Why doesn't Santa moon people from his sleigh? He's afraid of getting frostbutt! Our annual community sing along was postponed due to a snow storm, but was held with a small group of hearty souls the following week, December 28th. Thanks to Noela McGroarty and Marijke Dollois for decorating, Andrew Massey for pulling the program together and conducting, and to all who helped continue this Society and Community tradition. I'm starting to gather new jokes for next year. Grants.gov is a central clearing house, or online portal, for applying for federal grants over the internet. After an extensive (and sometimes confusing) process we successfully certified the MHS to apply for these grants. The next step will be to research some likely candidates and complete their applications. We could use some help is this area, if you can help us out let any Board member know. Thanks. MHS is 35 years Old!!! 2009 marks 35 years since a small group of concerned citizens organized and formed the Montgomery Historical Society. 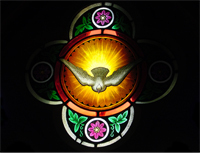 They saved what was then called St. Bartholomew's church from demolition and began a labor of love that remains vital today. The Board hopes to mount several special events to celebrate our anniversary this year including an exhibit of Montgomery's Marion Towle's (nee Gillman) paintings and embroidery. Please let Parma Jewett know if you have any items we might be able to photograph or exhibit. Thanks. In a sign of the times the Vermont Historical Society announced its annual History Expo for 2009 is canceled. Citing belt tightening due to budget cuts and other economic factors, the VHS said it would re-evaluate plans for 2010, and is soliciting ideas. So far some are suggesting smaller regional expositions, and rotating the site of the Expo. More info to follow. 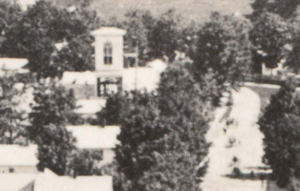 This photo from Betty Stanton shows Pratt Hall circa 1870-90, before the clock and bell. In fact they may be in the process of installing them as there appears to be a scaffold in place. Notice the lancet window where the clock is today. The shadows in the road on the right (now Route 118) appear to be horse drawn carriages. Betty Stanton donated a bevy of items reported on earlier and made an extra cash donation in November as well. Thank you ladies for your generosity. The Board voted, at our regular monthly meeting in November, to use the Lalia Pratt Hays Scholarship CD to pay down the mortgage on the former Heaton property by $6,300. The Scholarship account has never generated enough income to cover what we award, requiring the General Fund to make up the difference. Additionally, the interest we were earning on the account was about half the interest we were paying on the mortgage, so we felt we could get more bang for the buck this way. We will continue to award the scholarship as before but will fund it entirely from the General Fund. The mortgage will be about $17,000 as we begin the new year, and we will consider additional reductions as deemed financially responsible once we begin our 2009 membership drive. 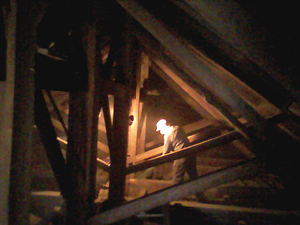 Prior to treating Pratt Hall for insects we must clean the attic so the timbers can be sprayed. Pat Farmer, John Beaty, and Bill McGroarty got us off to a good start in September. Another group comprised of Pat, Ken Secor, Charlie Fichman, Allan Kalsmith, Tim Chapin, and Glen Bartolomeo finished off the bulk of the large debris removal in late October. We will be renting a large vacuum and cleaning the dust and soot this spring. It was nasty work with our dust masks black by the time we finished. We will spray in June. The same day Sue Wilson and Marijke Dollois put the gardens to bed for the winter and Parma supplied the whole crew with coffee and homemade doughnuts! Thanks to all. Pat Farmer cleaning the attic of Pratt Hall. Photo by Ken Secor using his cell phone! We will begin our annual membership drive in March. In addition to the satisfaction of knowing you are doing a good deed, you will receive membership discounts, this newsletter, and complimentary Megabucks tickets for all of 2009 ( I made that last one up.) Membership and all donations are tax exempt. Please let us know if you need a receipt. In 1917 the state became one of the first in the east to allow women to vote and hold office but only at the local level. The 19th amendment was passed by Congress in 1919 and then sent to the states to be ratified. It was received in Vermont after the legislative session had ended, and in spite of the work of the state's suffragists, Governor Percival Clement refused to convene a special session to vote on the amendment. The national amendment was ratified in 1920, but Vermont did not amend its constitution until 1924. Source "VT Book Of Days" and VT Historical Society. 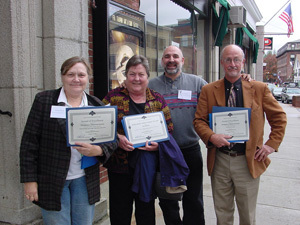 The Society's VT History Expo exhibit received an award for Excellence in Exhibits and Museum Techniques. This exhibit documented the innovation claimed by the Atlas Plywood Corporation in the manufacture of 3-ply hardwood plywood packing cases manufactured in Montgomery by the Nelson and Hall Company in the early 1900s. It was cited for expanding the knowledge of the manufacturing process and providing a snapshot of one of the major cultural influences in Montgomery's history for the period.